Most of this information is culled from Ron Davies' book: One Man's Dream: the Architectural Art of Major Kenneth Hutchinson Smith. Thanks to Rodney Blood for his help. Smith was a Canadian who came to this country in 1915 with the Canadian armed forces. He married an English girl and stayed. He had spent some time with the Royal Engineers and this seems to have been his only qualification for setting up as a builder and designer of houses. For some reason he got it into his head that houses should be designed and built in the old fashioned way, with traditional craftsmanship. For this purpose he gathered together bricklayers who could and would work with reclaimed bricks and lime mortar, wood carvers, and carpenters who would work without modern tools. He went one considerable step further: where possible he would use old timbers to build timber framed houses, with old bricks and old stones. He quarried these materials from wherever he could: bits left over from when Bradley Hall was removed from Kingswinford to Stratford, large parts of Lymore Hall, Montgomery, stone from Montgomery Castle, timbers from the New Ship Inn, Shrewsbury and so on. In this respect, note Davies' comment (p.53) in his notes on one house in Castlecroft Gardens: "Unfortunately like so many of the properties built by K.H.Smith there are very few definite records of what timbers are what, either their source or their eventual situation, though is known that he acquired timbers from such local places as Wolverhampton's former Deanery and Henwood Road, Tong Castle near Albrighton; even timbers and other ancient materials from Bilston's W.Cole, a merchant who in his early years demolished many local old houses and cottages". In two cases Smith undertook the wholesale removal of complete buildings. The Buttermarket, Shifnal, was re-erected as No.3 Castlecroft Gardens (Smith being sufficiently obstinate in his views of restoration as to refuse to install a kitchen in the restored house). The Buttery, Castlecroft Gardens - the Buttermarket Shifnal, moved and re-erected by Major Smith. And in respect of Greybeams, Castlecroft Gardens, Davies (p.55) records "the complete fabric of a former seventeenth century Pattingham cottage set up here in the Gardens as the wing of an otherwise modern structured building". 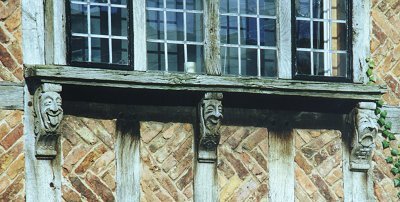 Not all of his houses were so closely modelled on medieval exemplars - for example, some of them have no external beams at all. Note: it used to be a not uncommon practice, in older times, to re-use old timbers for new buildings - after all, timber was expensive and shaped timber was even more expensive; and oak, in particular, gets stronger and stronger the older it becomes. It is often said that old timbers from ships broken up at Bridgnorth and other Severn ports, were used in houses from the Severn as far as Wolverhampton. The only evidence of this I have ever seen is what seem clearly to be ship's timbers used in the roof of Graiseley Old Hall. Smith seems to have had a romantic notion that not only could one build medieval houses but also a medieval village to contain them. He seems to have started with some sort of village (or estate) scheme in Finchfield Gardens. But Davies does not do much more than mention this scheme, so its history, and the reason why he abandoned it, do not appear. He moved on to his major effort and major memorial, Castlecroft Gardens. He seems to have thought of this estate as some kind of resurrected medieval village, complete with a village green and maypole; but the village green was at one end, not in the middle, and this medieval village also had a tennis court. But his methods were so expensive that the houses sold badly; and when he compromised his ancient principles and designed more modern houses, these sold even more badly. The outbreak of the Second World War made things worse and Smith's death in 1945, four days before the war's end, put paid to the whole enterprise, except for a couple of buildings which were completed by his foreman. Smith's activities leave Wolverhampton with several remarkable buildings, Castlecroft Gardens (now a conservation area), parts of Finchfield Gardens and the strange sight of a commercial building from the centre of Shifnal re-erected as a residence in suburban Wolverhampton (it is now a listed building). An example of Smith's work at Castlecroft Gardens. This is the only semi-detached pair. The Ridgeway, Springhill Lane. (Photo courtesy of David Berriman, of Tettenhall High Street, through whom the property is, at September 2001, on sale). And there are also several of his houses in the area or nearby which are not part of estates. Of these a good example is the Ridgeway on Springhill Lane. 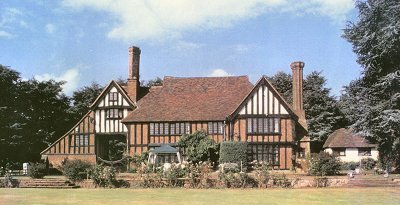 This very large house, standing in extensive gardens, includes timbers from Lymore Hall and various other sources, including buildings in Shrewsbury, mostly the New Ship Inn. 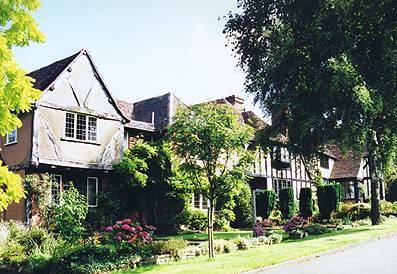 Another example is the Tudor House at Histon Hill, Oaken, which was built using bits from Lymore Hall; Montgomery Castle; Bentley Hall, Darlaston; and an old inn at Dudley. The house was once occupied by a doctor (who may have been the first owner) who conducted his practice from here. These faces are reputed to represent, on the right, the patient arriving in pain, on the left, the patient having his tongue examined and, in the centre, the happy and cured patient. An interesting question is the extent to which Smith's enthusiasm for Tudor and Jacobean buildings, materials and styles, leave Wolverhampton, and even the rest of the country, with a taste for building in the Mock Tudor or Tudorbethan style. It is sometimes asserted that Smith invented the 20th century taste for the style. In the 20s and 30s there were certainly modern residential styles available and Wolverhampton has a few examples, particularly of the High and Over modern style, as well as swathes of suburbia showing modern, even art deco influence. But in Wolverhampton, let alone the rest of the country, there were plenty of examples of new houses with planks fixed to them in imitation of half timbering. 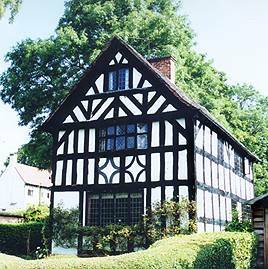 These are often labelled Arts and Crafts, and the leading examples would be Wightwick and Woodlands. Smith had clearly acquired the same sorts of theories about old craftsmanship as had enthused many people from Ruskin to the Cotswold Group. There had been increasing interest in preserving (from demolition and over vigorous restoration) old buildings from the 1880s onwards. Smith seems to have blended these trends together in varying quantities and produced everything from straight rebuilding, through new build incorporating old designs and some old materials, to what can only be described as not very good Stockbroker's Tudor, built entirely from new materials. 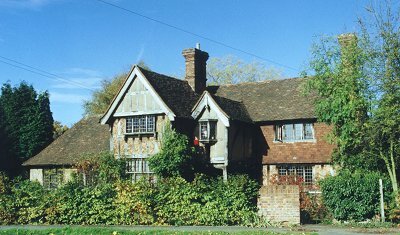 But he was far from the only person building new suburban houses with half-timbered features; and unless it can be shown that his buildings (perhaps through features in the architectural press or even in the popular lifestyle magazines of the time) were well known around the country generally, Smith cannot be fairly blamed for or credited with the popularity of Mock Tudor in the suburbia of this country. What he might have done is revived an interest that was flagging after the Arts and Crafts style had waned in popularity. More examples of Smith's work at Castlecroft Gardens. Even in this small picture it is possible to see that these were far from the average spec builder's Mock Tudor. A list of buildings designed and built by Major K H Smith. Full descriptions of these buildings can be found in Davies. I have extracted here only information about the origins of the materials. Davies does not give a date for many of the buildings. (Unfortunately this makes it difficult to make any assessment of how Smith style may have changed or developed.) I have tried to list them from the most distant from Wolverhampton to the closest. Stratford on Avon: Tudor Close, Fairways, Broadways, Greenways. (All built in part from the timbers of Lymore Hall (near Montgomery Castle) and Bradley Hall (originally in Kingswinford but removed and re-erected in part in Stratford)). Lymore and the Thatched House, Little Aston, nr. Streetly, Warks: (built from bits of Lymore Hall). Prestwood, Staffordshire: Tinker's Cottage (built using timbers from the old cottage on the site and others from an unknown source, probably on the Welsh borders). Tudor House, Histons Hill, Oaken. 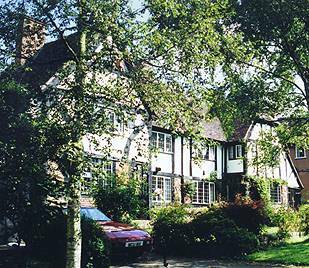 (built using bits from Lymore Hall; Montgomery Castle; Bentley Hall, Darlaston; and an old inn at Dudley. Finchfield Gardens: the Chalet (now demolished), two other matchboard bungalows, and "a number of Dutch colonial styled" houses. It seems that any other properties now in Castlecroft Gardens were not designed or built by Smith. The houses fronting the main road, between the two entrances to Castlecroft Gardens, were not built by Smith and seem to predate his buildings.